Want an approximate price? Get a free quote. 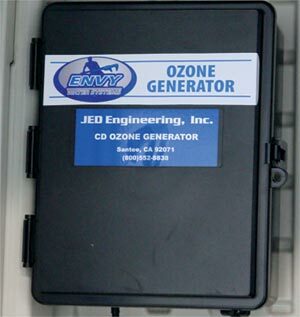 The ENVY™ Ozone Generator is designed for specific use in water tank reservoirs of 500-1000 gallons. Using ozone technology with dual corona discharge tubes, our ENVY™ Ozone Generator will keep your reservoir crystal clear and bacteria free without using chlorine. Ozone oxides the iron, manganese, and sulfur in the water to form insoluble metal oxides or elemental sulfur. These insoluble particles are then removed by post-filtration. Organic particles and chemicals will be eliminated through either coagulation or chemical oxidation. Ozone is Generally Recognized as Safe (GRAS) by the FDA for the water processing, water bottling, and food processing industries. Ozone is effect over a wide pH range and rapidly reacts with bacteria, viruses, and protozoans and has stronger germicidal properties then chlorination. Has a very strong oxidizing power with a short reaction time. The treatment process does not add chemicals to the water. Ozone can eliminate a wide variety of inorganic, organic and microbiological problems and taste and odor problems. The microbiological agents include bacteria, viruses, and protozoans (such as Giardia and Cryptosporidium). The formation of oxygen into ozone occurs with the use of energy. This process is carried out by an electric discharge field as in the CD-type ozone generators (corona discharge simulation of the lightning), or by ultraviolet radiation as in UV-type ozone generators (simulation of the ultraviolet rays from the sun). In addition to these commercial methods, ozone may also be made through electrolytic and chemical reactions. In general, an ozonation system includes passing dry, clean air through a high voltage electric discharge, i.e., corona discharge, which creates and ozone concentration of approximately 1% or 10,000 mg/L. In treating small quantities of waste, the UV ozonation is the most common while large-scale systems use either corona discharge or other bulk ozone-producing methods. The raw water is then passed through a venturi throat which creates a vacuum and pulls the ozone gas into the water or the air is then bubbled up through the water being treated. Since the ozone will react with metals to create insoluble metal oxides, post filtration is required. Brian is a Fort Myers Native and has been in the plumbing field for over 15 years. After learning the trade of plumbing as a young man, he worked for a large reputable plumbing company in Fort Myers for several years as a service plumber. He began his own water treatment company and at that time became, a State Certified, Licensed Plumbing Contractor. West Coast Plumbing has been a successful company for the past several and will be for many years to come. Brian is originally from England, and has been in the plumbing field for over 10 years. He has been a lead technician with West Coast Plumbing since 2013. Prior to joining our West Coast Plumbing team Brian worked for another reputable plumbing company in the area. He has since earned a spotless reputation within the tri county area with our West Coast Plumbing Customers. Hugh retired to Florida after owning a plumbing company in England. He has a lifetime of experience and has become an asset to our company. We highly value his experience and look forward to learning from it. Cody has been a part of the West Coast Plumbing team since 2014 and has developed many skills since. He has become our water treatment specialist & installer, and maintains several commercial accounts. Cody is also a well-rounded plumbing technician, and commercial plumbing installer. Stephanie has been in the plumbing business since 2003. Previously working for a reputable Fort Myers plumbing company as the new construction assistant manager. Stephanie has been a part of the West Coast Plumbing team since 2011.